You still have a few years before your first recommended mammogram! Get a Pap test every 3 years if you are 21 or older and have a cervix. 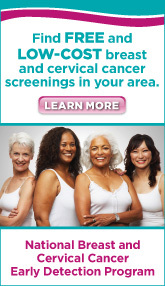 If you are 30 or older, you can get a Pap test and HPV test together every 5 years. You still have a few years before your first recommended colorectal exam! This may be a great time to get started. Discuss your options with a doctor or nurse. Get a Pap test and HPV test together every 5 years if you have a cervix. Starting at age 50, get screened every 2 years. Starting at age 50, get screened for colorectal cancer. Talk to your doctor or nurse about which screening test is best for you and how often you need it. Get screened every 2 years through age 74.Age 75 and older, ask your doctor or nurse if you need to be screened. Ask your doctor or nurse if you need to get a Pap test. Get screened for colorectal cancer through age 75.